Doctors are begging patients with minor ailments to see a GP instead of clogging up Queensland emergency departments. Patients with acne, splinters and warts are clogging Queensland emergency departments as doctors plead for them to instead seek help from a GP. About 32 per cent of the 155,000 emergency department presentations in the state's public hospitals every month could instead be treated by a GP, Queensland Health's Chief Clinical Information Officer Keith McNeil said. "We've had presentations for acne, hiccups, ingrown nails, blisters, warts and sunburn - not to mention the thousands of sprains and bruises our ED nurses and physiotherapists treat," he said. "Our outstanding ED clinicians work hard, saving life and limb, and ensuring people are treated in a timely manner (and) these non-emergency and less severe type presentations make it much harder to do that. In the six months to June, 33 people sought emergency treatment for acne, 43 for an ingrown nail, two for nightmares and more than 2000 for splinter removal. People also sought help for warts, nappy rash, new prescriptions and bruises. 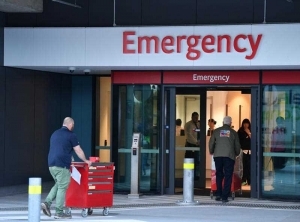 Figures from Queensland Health for the month of June showed around 3900 people across the state walked out of emergency departments before receiving treatment because they were not prepared to wait to see a doctor. However a spokesperson from Queensland Health said this figure represented just 2.55 per cent of the 153,000 patients who fronted EDs in that month. "This is half of the five per cent benchmark that was set a number of years ago by the Queensland Emergency Department Strategic Advisory Group, after clinical consultation, as an internal measure for Queensland public hospitals," she said. She added that almost all of those who left were the lowest level category five patients with minor ailments.